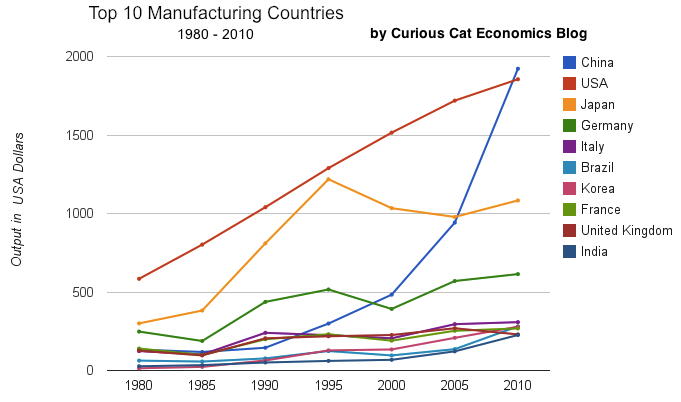 In my last post I looked at the output of the top 10 manufacturing countries with a focus on 1980 to 2010. Here I take a closer look at the last 10 years. In 2010, China took the lead as the world’s leading manufacturing country from the USA. In 1995 the USA was actually very close to losing the lead to Japan (though you wouldn’t think it looking at the recent data). I believe China will be different, I believe China is going to build on their lead. As I discussed in the last post the data doesn’t support any decline in Chinese manufacturing (or significant moves away from China toward other South-East Asian countries). Indonesia has grown quickly (and have the most manufacturing production, of those discussed), but their total manufacturing output is less than China grew by per year for the last 5 years. The four largest countries are pretty solidly in their positions now: the order will likely be China, USA, Japan, Germany for 10 years (or longer): though I could always be surprised. In the last decade China relentlessly moved past the other 3, to move from 4th to 1st. Other than that though, those 3 only strengthened their position against their nearest competitors. Brazil, Korea or India would need to increase production quite rapidly to catch Germany sooner. After the first 4 though the situation is very fluid. Taking a closure look at the large group of countries after top 4. Chart of manufacturing production from 2000-2010. 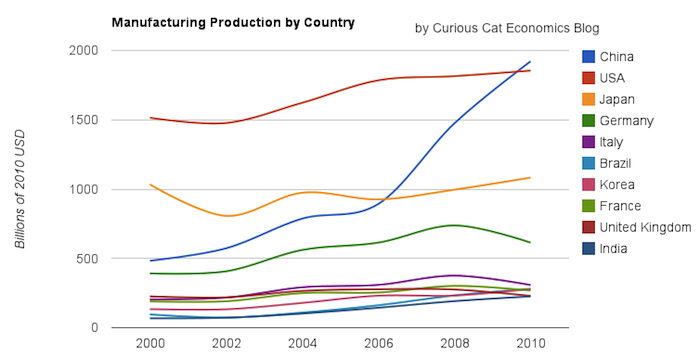 Chart of manufacturing production by the leading manufacturing countries (2000 to 2010). The top 4 countries are left off to look more closely at history of the next group. The chart was created by the Curious Cat Economics Blog based on UN data. You may use the chart with attribution. Removing the top 4 to take a close look at the data on the other largest manufacturing countries we see that there are many countries bunched together. It is still hard to see, but if you look closely, you can make out that some countries are growing well, for example: Brazil, India and Indonesia. Other countries (most in Europe, as well as Mexico) did not fare well in the last decade. The UK had a particularly bad decade, moving from first place in this group (5th in the world) to 5th in this group and likely to be passed by India in 2011. Europe has 4 countries in this list (if you exclude Russia) and they do not appear likely to do particularly well in the next decade, in my opinion. I would certainly expect Brazil, India, Korea and Indonesia to out produce Italy, France, UK and Spain in 2020. In 2010 the total was $976 billion by the European 4 to $961 billion by the non-European 4. In 2000 it was $718 billion for the European 4 to $343 billion (remember all the data is in 2010 USD). 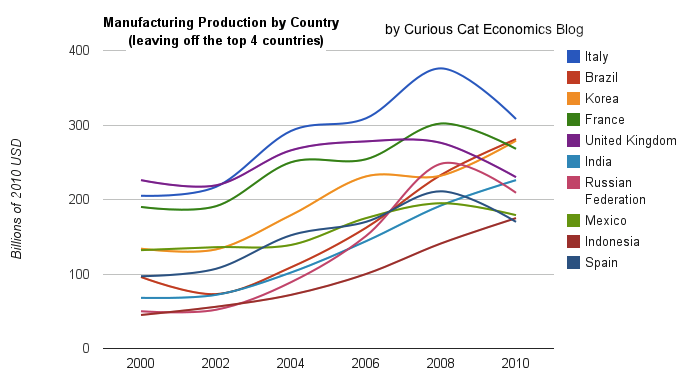 Chart of output by top 10 manufacturing countries from 1980 to 2010. The chart was created by the Curious Cat Economics Blog based on UN data. You may use the chart with attribution. China has finally actually taken the lead as the largest manufacturer in the world. Reading many news sources and blogs you may have thought the USA lost the lead a couple of decades ago, but you would be wrong. In 1995 it looked like Japan was poised to take the lead in manufacturing production, but they have slumped since then (still they are solidly the 3rd biggest manufacturer). China has been growing manufacturing output enormously for 20 years, and they have now taken the lead from the USA. Looking more closely at some of the long term data shows how much China stands out. From 1980 to 2010 China increased output 1345%. The total top 10 group increased output 302% (all data is in current USD so inflation accounts for most of the gain, 100 1980-USD equal 280 2010-USD). From 1995 to 2010 China increased output 543%. The group increased 64%. For 1980-2010, the results for the other 3 largest manufacturing countries are: USA up 218%, Japan up 261% and Germany up 148% (other countries doing very well are Korea up 1893% and India up 737%). Looking at the last half of that period, from 1995-2010 the: USA up 44%, Japan down 11% and Germany up 19%. One thing to remember about adjusting manufacturing data for inflation is that often the products created in later years are superior and cost less. So that a computer manufactured in 1990 which added $5,000 to the manufacturing total is far inferior to one in 2010 that added just $1,000. This point is mainly to say that while the increase in manufacturing in real (not inflated dollars) is not as high as it might seem the real value of manufacturing good did likely increase a great deal. But the economic data is based on price so manufacturing increases are reduced by cost decreases. Computers are the most obvious example, but it is also true with many other manufactured goods. You can that the other largest manufacturing countries fail to keep up with the increases of the entire group of the top 10. China’s gains are just too large for others to match. If you remove China’s results (just to compare how the non-China countries are doing) from 1980-2010 the increase was 216% (so compared to the other 9 top manufacturers over this period the USA was even and Japan better than the average and Germany was worse). And from 1995-2010 the top 9 group (top 10, less China) increased just 28%: so the USA beat while Japan and Germany did worse than the other 9 as a group. See the full list of Dividend Aristocrats below. The stocks in this index are companies within the S&P 500 that have increased dividends every year for at least 25 consecutive years. After 10 were added and 1 removed, this month, there are now 51 companies included (so just over 10% of all S&P 500 stocks) – and remember many S&P 500 stocks haven’t existed for 25 years, or pay no dividend today, or didn’t 10 or 20 years ago (Google, Apple, Intel, …). It is surprising so many companies have successfully done this. I’ll take a look at a few of them here (I looked at the new additions in my previous post: Investing in stocks that have raised dividends consistently). Really almost all of these stocks are pretty attractive. Medtronic, Johnson & Johnson and Abbot Laboratories look particularly appealing to me (along with Aflac and Kimberly-Clark). I would have to do more research on any of these (other than Abbot Laboratories, which I already own) before deciding to buy, but they sure look good as safe long term investments. Health care is a growing need (in the USA and globally). It is true the costs in the USA have to be reduced, and this could make things more difficult for companies in the health care industry. Related: Sleep well investing portfolio – Looking for Dividend Stocks in the Current Extremely Low Interest Rate Environment – Is the Stock Market Efficient? Full list of Dividend Aristocrats, an index measures the performance of large cap, blue chip companies within the S&P 500 that have followed a policy of increasing dividends every year for at least 25 consecutive years. Welcome to the Curious Cat Investing, Economics and Personal Finance Carnival: find useful recent personal finance, investing and economics blog posts and articles. Mark Cuban, invest in yourself. Keep your cash – wait to get a bargin based on the cash your have which allows you to take advantage of market opportunities. There is an increasing trend to move from the USA to another country to work and live. This is not surprising to me. Recently this has picked up quite a bit; I am surprised by the velocity at which this interest in moving (I figured it would be a long term mega trend but not so drastic, so quickly). Economic changes are often quite surprising in how rapidly they move forward. An interesting survey shows USA investors have become much more interested in relocating in the last two years (the data they show though has tremendous volatility over time, so I am not really sure this means much). I wonder how much of it can be explained by investors wanting to get a deep understanding of very promising markets. I wouldn’t image the actual number that do this is huge, but maybe the number considering it is significant. Billionaire investor, Jim Rodgers moved to Asia because he sees Asia as key to the future. One of the reasons I moved to Malaysia this year was to get a in depth understanding of what South East Asia is like (it is not a deciding reason, at all but maybe the 4th or 5th reason). The combination of long term policy weakness, the inevitable decline in the USA to world ratio of economic wealth, and the financial crisis caused by the policy weaknesses have seemingly greatly accelerated the trend. The next 2 or 3 years will determine if that is a permanent acceleration or if we go back to a slower pace – but on the same path. My guess is that we will stay on this path but the pace will not follow the level surveys might indicate (showing interest in such a big change is far different from actually moving). There don’t seem to be any decent estimates of Americans living abroad. The US State Department claims releasing their estimates would be a national security risk? And the Census bureau says it would cost too much to try. Wild guesses seem to be between 4 and 6 million. 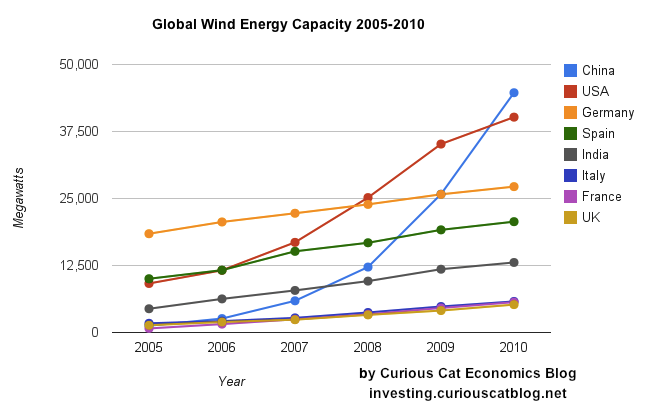 Chart by Curious Cat Economics Blog using data from the Wind Energy Association. 2011 data is for the capacity on June 30, 2011. Chart may be used with attribution as specified here. In 2007 wind energy capacity reached 1% of global electricity needs. In just 4 years wind energy capacity has grown to reach 2.5% of global electricity demand. And by the end of 2011 it will be close to 3%. By the end of 2011 globally wind energy capacity will exceed 240,000 MW of capacity. As of June 30, 2011 capacity stood at 215,000. And at the end of 2010 it was 196,000. As the chart shows Chinese wind energy capacity has been exploding. From the end of 2005 through the end of 2011 they increased capacity by over 3,400%. Global capacity increased by 233% in that period. The 8 countries shown in the chart made up 79% of wind energy capacity in 2005 and 82% at the end of 2010. So obviously many of other countries are managing to add capacity nearly as quickly as the leading countries. USA capacity grew 339% from 2005 through 2010 (far below China but above the global increase). Germany and Spain were leaders in building capacity early; from 2005 to 2010 Germany only increased 48% and Spain just 106%. Japan is an obvious omission from this list; given the size of their economy. Obviously they have relied heavily on nuclear energy. It will be interesting to see if Japan attempts to add significant wind and solar energy capacity in the near future. The unemployment rate fell from 9.0% to 8.6% in November, however that is not an accurate representation of employment in the USA. The news is good, but very mildly good, while a decrease in the unemployment rate by 40 basis points would lead you to believe the improvement was dramatic. Nonfarm payroll employment rose by 120,000 which is about the number needed to keep up with population growth each month. Employment continued to trend up in retail trade, leisure and hospitality, professional and business services, and health care. Government employment continued to trend down. The change in total nonfarm payroll employment for September was revised from +158,000 to +210,000, and the change for October was revised from +80,000 to +100,000. This means this report shows an increase of 192,000 jobs which is pretty good news (especially for those that think the economy has been in a recession – it has not). One year ago the unemployment rate stood at 9.6%. The number of unemployed persons, at 13.3 million, was down by 594,000 in November. The labor force, which is the sum of the unemployed and employed, was down by a little more than half that amount. What this means is the reduction in the unemployment rate was largely due to the decrease in those actively looking for jobs. Among the major worker groups, the unemployment rate for adult men fell to 8.3% in November. The jobless rate rates for adult women (7.8%), teenagers (23.7%), African-Americans (15.5%), and Hispanics (11.4%) showed little or no change. The jobless rate for Asians was 6.5%. The number of long-term unemployed (those jobless for 27 weeks and over) was little changed at 5.7 million and accounted for 43.0% of the unemployed. This is one of the numbers that has to come down drastically for the job situation to really show good improvement.